You might have thought it was difficult to improve on a traditional apple pie e liquid but the Apple Pie by Kilo Black Series has done just that. The primary flavours are apple, cinnamon and pastry and while easy enough to replicate in E juice form, this one is very different to the norm. Created in such a fashion as to replicate a warm apple pie filled with an array of flavourings such as cinnamon this will take you back to your childhood. Quite how they layer these flavours so they all emerge in their own right is amazing, how they stick it in one bottle, who knows! Customer feedback for the Apple Pie by Kilo Black Series has been phenomenal. We have seen people converted who have never even vaped any type of Apple e liquid before. The ability to taste the pastry, as a sideshow to the Apple and flavourings, has in the eyes of some customers created something which would make “grandma jealous”. How do you beat that? Apple Pie by Kilo Black Series has a PG/VG ratio of 30%/70% and is available in 60 mL bottles. Simple, perfectly mixed and a throwback to your childhood, these are just some of the compliments about the Marshmallow Crisp by Kilo White Series e liquid. The primary flavourings are toasted rice cereal with gooey melted marshmallows - does it really get any better? In effect this is a mixture of classic rice cereal and marshmallow bar in e liquid. Yes, fill up your mod, lie back and enjoy a slice of your childhood any time you want. Sometimes, just simple is perfection…. This is the type of e liquid which gives you a slightly different blend and a slightly different flavour each time you inhale. Described by some as a sweet, caramel, butterscotch type flavour it really does have everything. The liquid is smooth, the hit builds up and you can taste all of the flavours and a variety of different blends. Just the description of gooey melted marshmallows is enough for some! Marshmallow Crisp by Kilo White Series has a PG/VG ratio of 30%/70% and is available in 60 mL bottles. Creating a quality milk e liquid is not easy but the Vanilla Almond Milk by Kilo Moo Series E juice ticks all of the boxes and more. The primary flavours are creamy milk, vanilla and almond which come together to create an exquisite delicious mix with almond definitely offering something a little different from the norm. The creamy texture of vanilla flavoured milk is perfectly contrasted by the sweet almond flavour which grabs the back of your throat. Your taste buds will be dancing, you will feel the flavour flowing as you chill and relax. Customer feedback has focused on the exceptional balance in flavourings between the milk, vanilla and almonds. As part of the Moo Series it has very quickly become one of the more popular and a favourite with many people. The flavourings do get your taste buds confused with some people tasting pancake syrup and cookie dough. Versatile, smooth, perfect strength hit and extremely flavoursome, what more can you ask for? Vanilla Almond Milk by Kilo Moo Series has a PG/VG ratio of 30%/70% and is available in 60 mL bottles. Even the packaging for the I Love Cookies Too by Mad Hatter e liquid is a sight to behold! While some e liquid flavours fail to live up to the hype there is no doubt that this one has no difficulties. Even just a word “cookies” will get you salivating, reaching for your e-cigarette and just wondering what you can expect to taste. Well, the primary flavours are cookie, milk, caramel and strawberry which as you can guess, blend into an array of different tastes. The caramel tasting cookie tint has caught the attention of many users with regular mention of the subtle taste of strawberry. For those who enjoy donut E juice you are certainly in for a surprise with this one. As soon as you open the box you are hit with a smell of freshly baked cookies with a waft of caramel and a hint of strawberry. You will be licking your lips in anticipation, taste buds at the ready to chillout with your new best friend. 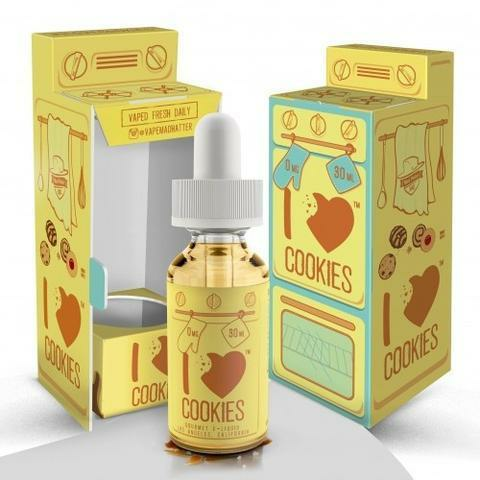 I Love Cookies Too by Mad Hatter has a PG/VG ratio of 30%/70% and is available in 60 mL bottles. Even the word cheesecake will have many of us salivating wondering just exactly how it is possible to replicate a traditional desert in an e liquid. Well, stand by your beds, the Purple Cheesecake by Mamasan e liquid does just that. Described as a purple coloured Filipino style rich creamy cheesecake it will take your breath away. The packaging shows you a glimpse of what is to come, the smell as you open the box tempts you in and then, a smooth creamy flavour with a lovely sweet hit. We could go on forever! Customer feedback for the Purple Cheesecake by Mamasan e liquid is littered with an array of five star ratings. Described as “being in a league of its own” with a flavour that goes pop but does not overpower you, this is one not to miss. The perfect blend of sweetness, creamy texture with a hit which builds up to a crescendo, this is yet another one for your e liquid to-do list. 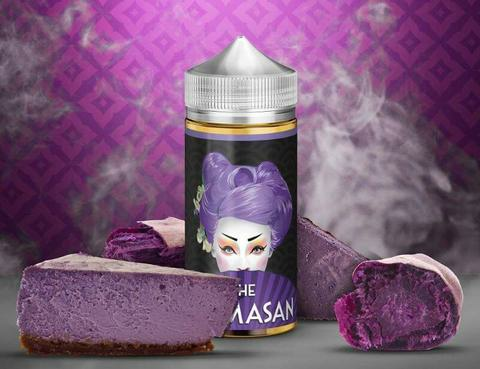 Purple Cheesecake by Mamasan has a PG/VG ratio of 30%/70% and is available in 100 mL bottles.